BRIDGEPORT, CT (CelebrityAccess) — Celebrating their 20th year, the Gathering of the Vibes festival has revealed some key additions to the lineup for for the 2015 installment of the popular New England fest. 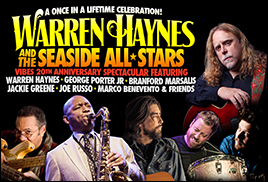 This year, Warren Haynes will be playing two sets and joining forces with the Seaside All-Stars, including Branford Marsalis, George Porter, Marco Benevento, and former member of the Black Crowes, Jackie Greene. The addition of Haynes to the lineup brings the Allman Brothers band members performing at the festival to four, with Gregg Allman, Derek Trucks, Jaimoe Johanson appearing as well. “Over the years, I’ve always enjoyed helping to plant a musical seed, a concept, and then watch it develop onstage into a unique and inspired artistic creation. Something that happens only once by joining musical legends with extraordinary talents can ignite a spark that so rarely is seen,” says festival founder Ken Hays. Other announced additions to the fest's lineup include Tea Leaf Green, John Brown’s Body, Cabinet, Trevor Hall, Banooba, Nattali Rize & Notis, Band Together CT and Fly Golden Eagle. In addition to the music, the festival offers a family-friendly atmosphere, including camping, Kids Corner and Teen Scene, Peace Parade, and a "School of Rock Teen Vibes Stage," featuring musical instruction and jam sessions with Main Stage artists.